Barbara Creel, a member of the Pueblo of Jemez, joined the UNM law faculty in 2007, bringing an expertise in Indian Country criminal defense. For seven years, she was an assistant federal public defender in the District of Oregon, where she developed a federal habeas corpus and post-conviction expertise. She assisted in the defense of Native American clients on cases from reservations prosecuted under the Major Crimes Act. Creel also worked at the trial level and argued before the 9th Circuit Court of Appeals. 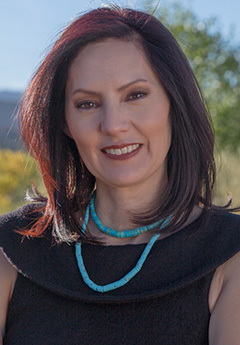 Prior to joining the UNM law faculty, she worked as tribal liaison for the Portland District of the U.S. Army Corps of Engineers, fostering government-to-government relations between the federally recognized Indian tribes and the federal government. She worked with tribal leaders, commanding officers and senior civilian managers, as well as the individual tribal members and corps staff, to translate complex Indian law issues among all parties and build relationships. Creel's interest in Indian law began when she worked for the Native American Rights Fund during her undergraduate years at the University of Colorado. Following graduation from the UNM School of Law in 1990, she worked for the National Advisory Council for Indian Education in Washington, D.C. In 1993, she joined the Native American Program of Oregon Legal Services in Portland. Creel returned to the UNM School of Law in 1995, first as a clinical fellow with the Southwest Indian Law Clinic and later as an associate professor and adjunct in the UNM Clinical Law Program. She taught for four years, during which she also spent time as an appellate public defender with the New Mexico Public Defender's Office. In 1999, she became an assistant federal public defender in Oregon. She was a contributing author in the 2005 revision of the Felix S. Cohen Handbook of Federal Indian Law. In addition to clinical and Indian law, Creel's academic interests include the intersections of Indian, civil, criminal and constitutional law. This course, Criminal Law in Indian Country, is designed to reflect upon crime and punishment in Indian Country, and the shared “criminal” history of tribal nations. The materials are designed to investigate issues of criminal law, constitutional law and Indian law as they affect Indian individuals, Tribes, and policy. We will identify and explore impacts on Tribal sovereignty and individual rights of Native American Indians that have occurred over time through U.S. policy, statute and case law in the name of crime and punishment – including Treaties, Crow Dog and the Major Crimes Act, Public Law 280, the Indian Civil Rights Act, Oliphant and Duro, and the more recent Tribal Law and Order Act of 2010. With historical impacts in mind, we examine contemporary issues, such as Native American overrepresentation in the criminal justice system, sentencing disparity, and Natives juveniles in the system. Students will also have an opportunity to review the unique aspects of criminal jurisdiction in different regions as part of the general understanding of criminal law and justice in Indian Country. Through a problem-solving approach, students will prepare a final paper and present on an issue related to criminal law in Indian Country. The goal of the paper/presentation is to expand and incorporate knowledge and contribute solutions to an emerging body of scholarship in this important and often misunderstood area of Indian law. Additional Course materials to be assigned by the professor. William C. Canby, Jr., American Indian Law in a Nutshell, 4th edition, 2004. The final grade will be based upon a seminar paper/presentation, in-class participation, and course assignments. The course is open to all students. There are no pre-requisites, but Indian Law or a background in Native American law or studies is recommended. We will study the rules governing the professional conduct of lawyers and explore the values of the legal system which justify and explain those rules. Specific subject matter includes: the duties of competence, confidentiality, and loyalty; acquisition and retention of clients (including undertaking representation, advertising, solicitation, and withdrawal from representation); and problems concerning the manner of representation (the "Principle of Professionalism" and "zealous advocacy within the bounds of the law"). Concepts will be illustrated through application of the rules to problems, use of video and audio clips for discussion, supplementary readings, and student presentations of rules and cases related to assigned fact patterns. In addition to the traditional final essay examination, quizzes on various topics, using questions taken directly from the MPRE practice exams, will be given throughout the semester. The course will consider the principles of law and rules governing the admissibility of testimonial and documentary proof in civil and criminal trials, including the concept of relevancy, the use of demonstrative evidence, direct and cross-examination of witnesses, impeachment of credibility, expert testimony, and hearsay. Traditional case materials, the federal rules of evidence, problems, and simulations will be employed to illustrate evidentiary concepts. This course analyzes the nature, scope and limitations of civil rights in Indian Country. As a dual-citizen with a distinct political relationship with a tribal government and the United States government as separate sovereigns, the individual Indian occupies a unique position in civil rights law. Students will examine the emergence of civil rights protections for individual Indians and discuss their enforcement in federal, state and tribal courts. We will identify the constitutional and statutory protections afforded to Indians and non-Indians and evaluate their impact and efficacy for Indians in state/federal and tribal forums and non-Indians in tribal courts. Materials will address the foundational questions of equal protection, due process, religious freedom, and protection from harm at the hands of the government for Indians on and off the reservation. The course examines the power and limitations of the United States to adequately protect the civil rights of Natives under its own constitution, as well as the Indian Civil Rights Act of 1968 (ICRA) as a vehicle to protect the rights of individual Indians vis-a-vis their tribe. Depending on the instructor, focus areas may include federal/state/tribal Indian civil rights actions in religious freedom, education, speech, gender, identity, enrollment and status, police action, and prisons. The class also examines the tribal role and response to ICRA, including the development of tribal infrastructures, common law and remedies to protect its citizens. Throughout the course, students will be challenged to revisit the so-called tension between individual rights and tribal collective rights and generate a discussion on tribal self-determination, good governance, and human rights. The goal of the course is to review civil rights in the tribal/federal context and to inquire whether federal/tribal civil rights laws work for Indian peoples. The course raises questions about civil rights protections, abuses, enforcement mechanisms, and remedies for tribal peoples. One objective of the course is to assist students in evaluating protections and remedies afforded to tribal peoples to challenge laws and governmental conduct that violate the United States Constitution or the Indian Civil Rights Act or both. Students will critically review civil rights issues in an Indian law context and develop frameworks, perspectives and responses to better protect Indian individual rights and include the tribe and tribal community interests. Background –The Southwest Indian Law Clinic (SILC) provides high quality legal representation and clinical practice experience in Indian Country. SILC is pro-active in the advocacy, promotion and establishment of indigenous people’s rights. SILC students may represent individual clients and/or tribal groups or Indian communities. Through representation, students may be exposed to issues arising from historical oppression, poverty and under-representation, and other issues related to culture, race and socio-economic status in the legal system. Students are taught to approach legal solutions premised on tribal sovereignty, cultural rights or traditional internal law, as well as general legal principles. Type of Case Work – The type of case work depends largely on the existing caseload and new case intake, but the Clinic experience is also driven by individual student interest and energy. The Southwest Indian Law Clinic handles cases arising under federal, state or tribal law. Students may have opportunities to appear in all courts and to assist clients in access and use of tribal traditional dispute resolution in their community. SILC cases allow students to engage in vigorous defense, active motion practice and extensive brief writing. These cases typically involve people that would go without representation, but for SILC. Clients – Potential clients come from the outlying and nearby Pueblos and tribal communities, and the urban Indian population. In addition to serving walk-in clients, SILC may provide legal services or intake at community intake sites in and around Albuquerque. Students may also engage in project work with tribal governments, non-profit organizations and non-governmental Indian organizations. Clinic Class and Office hours – Students will be required (1) to attend and actively participate in up to five classroom sessions (ten during summer’s first three weeks) during each week of the academic semester and (2) to maintain, in addition to classroom hours, a schedule of 24 (2-hours block) fixed office hours (physically present in the clinic, working on clinic matters) each week during Summer, or 16 (2-hours block) fixed office hours each week during Fall and Spring semesters. Classroom learning complements and supports both the high quality representation and professionalism in all dealings with clients, staff, supervisors, the judiciary, opposing parties and others. Classroom discussions of pending cases and assigned readings; role-play and simulation; and cultural and racial literacy exercises enable students to practice and gain confidence in skills such as, client interviewing and counseling, advocacy, and communication. Questions about the Southwest Indian Law Clinic? Please feel free to visit with Profs. Creel or Zuni Cruz. Have a great Clinic experience! Students enrolled in the Law of Indigenous Peoples class will be invited to join the Tribal Law Journal staff for the fall and spring semesters of their second and third years. The journal is an exclusively on-line journal devoted to advancing indigenous self-determination through promoting scholarship and discussion on internal indigenous law. Students will meet throughout the year to learn, not only correct Bluebook citation styles, but also how to cite sources of traditional law. Students will be given the opportunity to edit and source check scholarly papers submitted to the journal, including substantive and technical editing, as well as opportunities to promote the mission of the journal in the community and submit their own written work for publication. The journal provides students the opportunity to learn more about indigenous law and to contribute their voice to the discussion relating to the internal law of the world’s indigenous people. The editor(s) of the Tribal Law Journal will work with the Editor-in-Chief in soliciting and selecting for publication articles submitted to the journal on internal indigenous law. Student editors will work collaboratively with authors to create a final product that reflects the mission of the journal, and at the same time, maintains the integrity of the authors’ work. The editor(s) will also be responsible for teaching and supervising the editing work of the journal staff and the final overall substantive and technical editing of student and professional pieces submitted for publication. Students will have the opportunity to assist the Editor-in-Chief in promoting the journal and its mission, at a local as well as at an international level. This course also includes a web-editing component for students interested in using technology to increase access to the issues critical to the self-determination of indigenous people. Testimony on H.R. 1924, the Tribal Law and Order Act of 2009 Before the Subcommittee of Crime, Terrorism and Homeland Security United States House of Representatives, 111th Congress, 1st Session (December 10, 2009). Cohen's Handbook of Federal Indian Law (Nell Jessup Newton, et al., eds., LexisNexis 2005) (contributing author). Tribal Court Convictions and the Federal Sentencing Guidelines: Respect for Tribal Courts and Tribal People in Federal Sentencing, 46 U. S.F.L. REV. 37 (2011). The Right to Counsel for Indians Accused of Crime: A Tribal and Congressional Imperative, 18 MICH. J. RACE & L. 317 (Spring 2013). Sentencing Disparities in Native America, NATIVE AMERICA CALLING (June 4, 2015).